Ok- seriously. One of the many perks of having a newborn, is dressing them in cute clothes. Sure, when I had newborns I went through my share of simple onesies and sleepers. But sometimes, it's usually church days for us, it's super fun to break out the dress pants and ties for the boys and sweet dresses for the girls! I love dressing them up all cute, even if they probably will spill on their tops or mess their pants, oh well, they looked cute! Then comes the laundry. With a newborn, the term "doing laundry" holds a whole new meaning. You certainly are not going to have just one outfit a day for the child, no matter how hard you try. And, unless you're living in an extremely warm climate, like South India or something, you aren't going to keep your baby naked all of the time. You have a baby? Laundry is never "done." I remember learning early on that choosing the right detergent when washing clothes for a newborn is key. I also remember that it was important to wash the baby's clothes in a different load than daddy's work clothes just to be safe. One of the biggest concerns with moms of newborns is the issue of skin sensitivity. I know one of my kids would break out in rashes like crazy and it's hard to know if it's diet, detergent or something else! Using a detergent that is formulated for baby helps to ease that worry for most new moms. Purex now has a dermatologist tested formula detergent to fit this need! I don't currently have a newborn in the house anymore, but.... 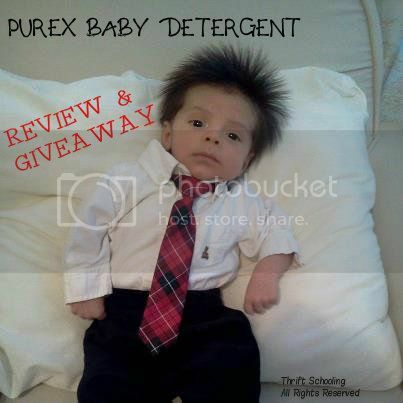 I let my friend with a new baby test out Purex Baby on the cutie pictured above and she said it works great! Purex Baby is hypoallergenic, clear in color and has a gentle baby-inspired fragrance. Not only is it gentle on baby's skin, but tough on messes! I commented on Purex's page.